One of the great things about the JUMP math program is the games that give students more opportunity to practice skills. Today we were practicing ordering and saying four digit numbers. Sometimes it gets a little noisy, but there is no question about everyone being on task! 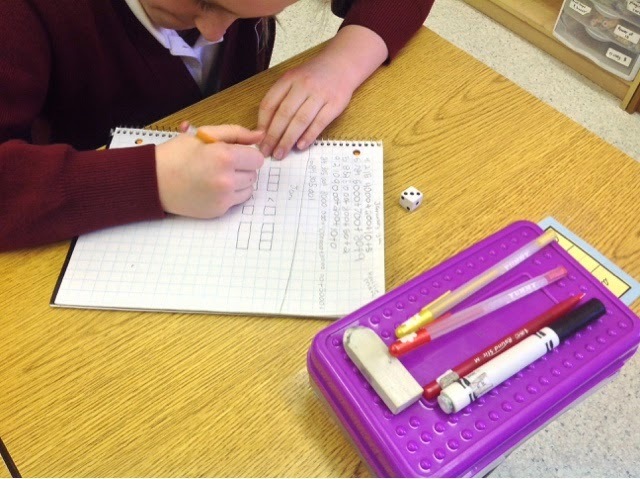 Worksheets do the trick, but games are definitely more fun. In this game they had to roll a dice and create a true statement (_ _ _ _ < _ _ _ _). They had to put the number rolled on one side of the equation, then the number rolled on the other side of the equation. If the statement was true after they had filled in all the blanks, then that student got a point. After that, they switched. The other person rolled the dice while the first student wrote he numbers this time. After they had achieved four points we added another place value spot so they were doing it with numbers in the ten thousands, then numbers in the hundred thousands. Nothing is more exciting to gr. 3 students! I told them that the government thinks students this age can only handle hundreds. They totally disagree! Do a worksheet for half an hour, or play a game for half an hour? The choice is easy!